There he sat at his table in the pathetic apartment that had become his living quarters. In front of him sat a shot glass, three-quarters full. A door opened and slammed shut, snapping him out of his daze. He didn’t turn to look. Behind him. A woman’s voice. His wife. Ex-wife in progress. Still, he didn’t turn to face her. He hadn’t thought about what it would look like if someone walked in on him. She came behind him and plopped a stack of papers on the table next to the shot. On top of the papers, she placed a bottle of gin, which she had retrieved from the pantry. A cruel paperweight. “So that you can finish what you started,” she said. And then she left his pathetic apartment as cruelly as she had entered, making sure that she slammed the door. Despite what she said, he stared at the shot glass for a few more minutes before he picked it up. “What does it taste like?” he had asked the guy. “No harsher than a shot of vodka.” he had told him. He poured the clear liquid down his throat and gagged. The guy had lied to him. It tasted much harsher than a shot of vodka. But perhaps after five months he forgot how unkind alcohol could taste. He felt a familiar tingling rush sweep over his body, his face, his brain. Then numbing. 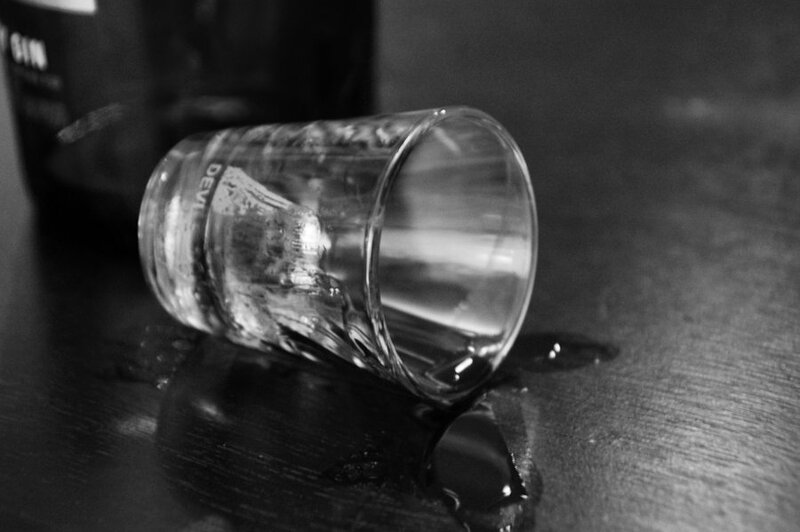 With shaking hands, he unsteadily placed the shot glass back on the table, where it fell over. After a moment, so did he. Whoa! Outstanding! I can't believe you managed to pack in so much with so few words. I'm very impressed. Wow. I felt my heart beating by the end. I am in awe (and, if I'm honest, a little jealous) of what you can do with 356 words. You shouldn't be jealous. You have done it before! What a sad story! I could feel it and I was a little anxious and nervous for him. Ohhhhh, “tiny coffin”! I was not expecting that ending, but then again, after all he went through, I guess I should have. As the others have said, a lot is going on in that meager 356 words, and it's a very strong story! Well done! Killer piece, man, pun intended, but seriously, really great. Been there, wouldn't give the c you next tuesday the satisfaction. Then things get a whole lot better. Very well done, if you didn't win who did? Oohoohoo, I liked this story a lot. How you managed a story of this caliber out of so little words is astonishing. Great job and an awesome twist! It's amazing how quickly I hated her, and felt so deeply for him! Nice work. Haha I like the pun! If not me, then one of the other great pieces. Thanks, Chiz. And thanks for the shout-out! Yea, she was pretty mean! Amazing how you made me feel such compassion for a man I never met in so few words. Thank you. I've never smiled at a suicide, that is until I read this exemplary work. Great job, Youngman. Wow! Insanely powerful for less words than there are days in a year. Great job! Poor guy. Who the hell was the “he” who gave him this stuff? Pretty horrid. ::whistles:: Small story, big punch~! You had me at “tiny coffin.” Great job! Loved the use of sparse dialogue. Did I mention how talented you are at this?? I totally didn't expect that ending. 365 words and I feel like I just read a sad, yet juicy novel. Best of luck in the contest!! Thanks for the kind words, Jax. Very powerful. I really felt that guys pain. Nicely done Mike. Your 365 word story has reminded me that I really, really need to work on my writing more. Beautiful piece. That was amazing. Having been through the loss of a home, a marriage and a child, I feel like you channeled the emotion beautifully.